Only those who love to bake and/or have the spare time to spend in the kitchen or have a great vegan cafe nearby can get hold of vegan cakes easily. I’m lucky to live in Exeter with some awesome vegan/veggie cafes so I can access scrumptious dairy free and vegan cakes between 9 and 5 Monday – Saturday (most of the vegan cafes are closed Sundays). However, if you do not have access to such cruelty-free cake loveliness or maybe you need a few cakes for an event, a work ‘do’ or a family get-together, then ordering online sounds like a pretty sensible solution in this day and age. Now the question is which baked goods to order….? 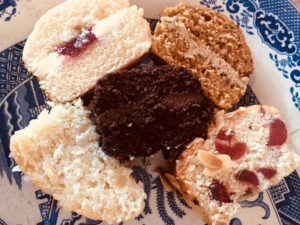 I was lucky enough to sample several cakes so here’s my thoughts and those of you who know I like my chocolate may be quite surprised! Vegan Coffee & Walnut Cake – now this flavour is not everyone’s favourite but it’s always pretty high up my list. I love coffee and walnut cake. Lorama’s version did not disappoint. Extremely yummy, coffee flavour not too strong, just about the right amount of walnuts and the butter icing was perfect! I would definitely order this one. Vegan Chocolate Cake – quite a mild amount of chocolate (could it be richer or is that just my personal taste?) but really lovely. The cacao nibs on top were a great addition. I would happily eat 10 of these in a row – I did tell you I liked chocolate ! 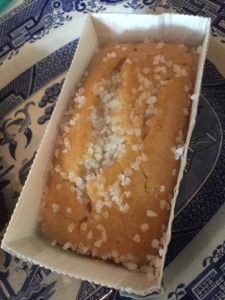 Vegan Lemon Drizzle Cake – never been a cake flavour I’ve personally fancied although they always seem incredibly popular and my other half loves them. This one was lovely, not too lemony but citrussy enough if you know what I mean. The addition of crunchy sweet sprinkles on top was nice too. Vegan Cherry & Almond Cake – now I have left the best until last as this cake (pictured above)…well how shall I put it? The Lorama Vegan Cherry and Almond cake was truly exceptional. 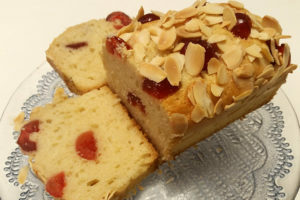 From the moment I opened the packet and inhaled the dreamy almond aroma to the sensation of all of those big fat cherries popping in my mouth – oh heavenly angels, this was one of the best cakes I’ve tasted in a long time and needless to say it did not last very long in my gluttonous clutches! What came across most to me with all of these cakes was really how incredibly perfect they were – all such a smooth texture and baked to absolute perfection. No crispy edges or soggy bottoms like mine sometimes are! So thank you to Lorama for letting me be their guinea pig – or just a piggy really! Sorry family, I’ll make you a cake to apologise for eating them all before you got back from school/work – or maybe we could just order from Amazon!!! 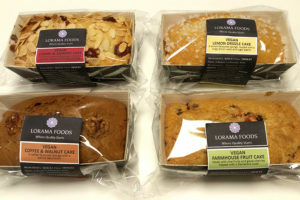 You can order a Vegan 8 pack of mini cakes on Amazon – made up of two of each if you want to try them all out which I strongly recommend you do. Yum. Don’t forget to subscribe to my newsletter for news on new vegan products, competitions, giveaways and discounts. If you’re looking for more money saving and cash creating ideas – join the friendly Super Savvy Vegan Facebook group. I’m also on twitter and Instagram. Previous post: Moo Free Chocolate Giveaway!